Yum, yum, yum, yum, YUM! It’s really all I can think about during this time of year. I mean, look, don’t get me wrong, I love being reminded to be thankful and all that good stuff- but I also like food. I like food a lot. Anybody with me? I figured you guys would be. That’s why I’m combining my love with my pressure cooker and my love for the biggest food holiday of the year and giving you this; 20 Pressure Cooker Thanksgiving Dishes. Badabing, badaboom, I’m sharing some delicious meal planning ideas with you. Okay, that was a little more than cheesy, but for real- I’m totally geeking out over this. I have a split family in so many ways, so holidays are CRAZY for us. That means my Pressure Cooker comes in handy like you’d never know. Plus, we live in a super small house, so it gets back-to-back use when I’ve got big meals to cook. One thing comes out and another thing goes in. The circle of the Instant Pot lives on! 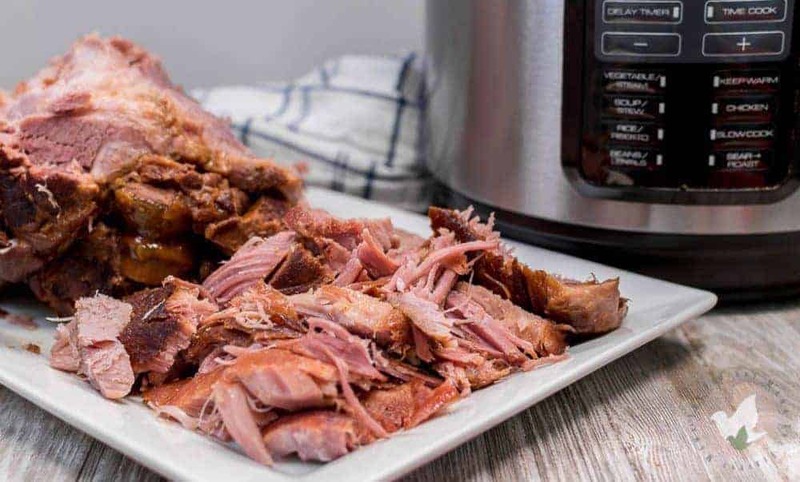 This beloved holiday ham is fall apart tender and deliciously sweet! Everyone at the table will want seconds of these carrots coated in a yummy honey butter glaze. This pretty squash just might upstage the turkey with its classically fall flavors! Low-carb, keto, vegan, gluten-free and paleo! Be ready to fall in love with this tasty dish! Deliciously creamy and so rich! It’s the perfect holiday dessert! You’ll be drooling all over the sweetness of the potato, the saltiness of the walnuts, and the melty-ness of the marshmallows! Not cooking a big turkey this year? Use your pressure cooker to make these juicy turkey breasts! Serve these yummy artichokes with a spicy garlic mustard dip to add some zing to this appetizer. Add some cinnamony deliciousness to your Thanksgiving table and make your home smell amazing at the same time with this sweet treat! Topped with whipped cream and/or caramel sauce this pumpkin cheesecake is perfectly perfect for Fall or anytime! 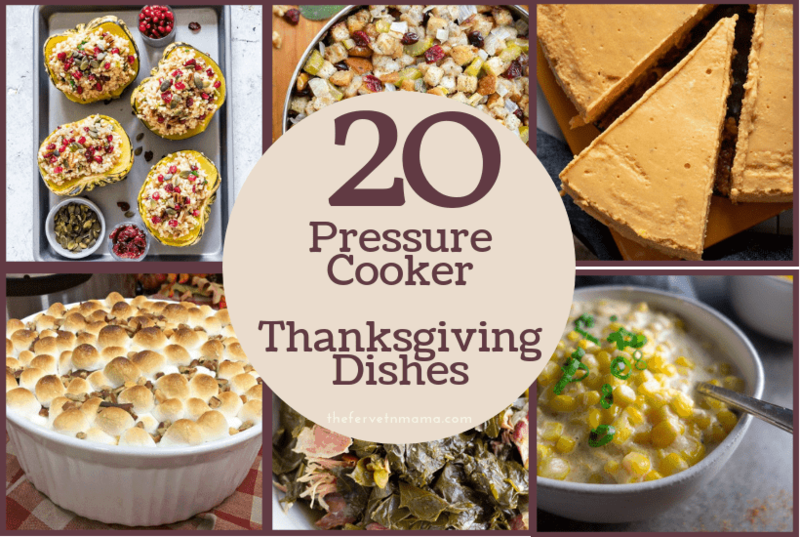 Ready for 10 more Pressure Cooker Thanksgiving Dishes? Weight-watcher friendly, quick and easy to make and the perfect side dish compliment for your turkey! Delightfully smooth but thick texture, low-carb and a perfect alternative to mashed potatoes! This mouth-watering pumpkin pie pudding is crustless, low-carb and an easy dump-and-go dessert choice for your busy day! Savor the blend of these sweet, spicy and tangy flavors! This bright and colorful chutney will make a delightful addition to your holiday table. This Southern girl loves me some southern cooking, and these tender collard greens are full of flavor (in half the time) and won’t disappoint! Tired of turkey? Try this super easy and delicious Rotisserie Style Chicken recipe. Low-carb, keto and gluten-free but doesn’t skimp on flavor! You might never buy Rotisserie in the store again! This creamy dish adds a little sass and a lot of taste! Add a little color to the table and warm your soul with this sweet, rich and buttery treat. This classic side dish just got easier with your Instant Pot. Rich and creamy and just begging to be eaten! And if you’re feeling bold why not change it up a bit by adding some garlic or cheese?! What would a Thanksgiving table be without the traditional stuffing side dish? It’s pretty, easy to customize according to your taste, scrumptious, and it’s a classic…so go for it! 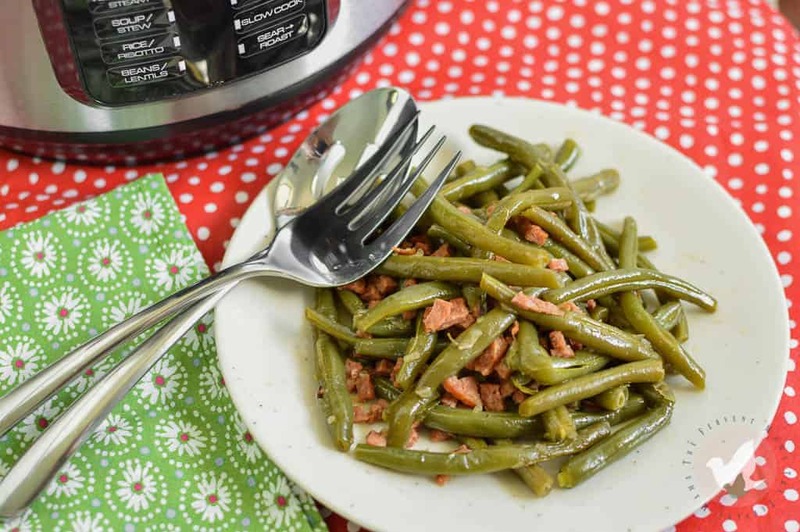 These delicious, flavorful, smothered and southern style pressure cooker green beans are to die for! Are you on Facebook? If you’re like us, you love joining groups to interact with like-minded people. If that’s you too, we’ve got the perfect group for you! Pressure Cooker Family Recipes is a great group for you if you love your pressure cooker and you like camaraderie. Boom. Welcome to the fam! What are your plans for cooking in your pressure cooker this holiday? 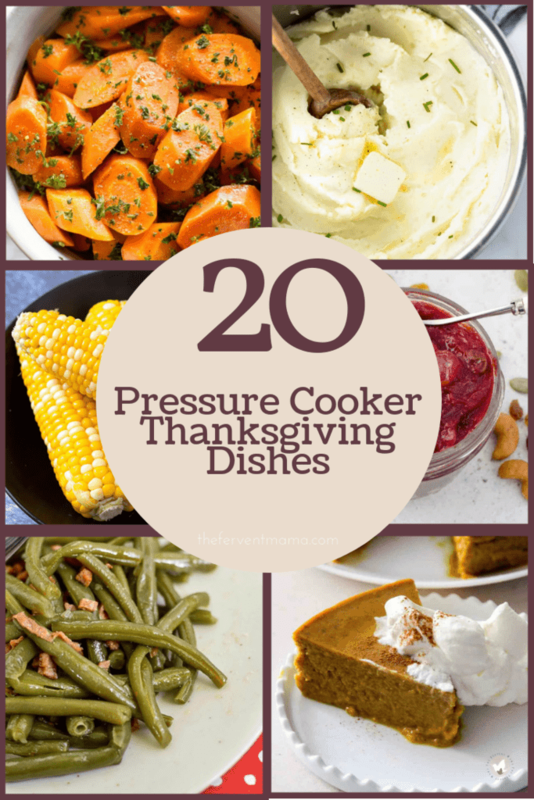 Will you be cooking any of these pressure cooker Thanksgiving dishes? What about holiday plans, you have crazy days too? « Simple Machines Study with our friends at Fritz’s Adventure!